LOS ANGELES — The Walt Disney Company has created what it believes is a first-of-its-kind application allowing Facebook users to buy tickets to “Toy Story 3” without leaving the social networking site and while, at the same time, prodding their friends to come along. A new application created by Disney allows moviegoers to buy tickets for “Toy Story 3” and invite their friends to join them without leaving Facebook. The application, called Disney Tickets Together, could transform how Hollywood sells movie tickets by combining purchases with the powerful forces of social networking. When you buy a ticket through Disney’s application, for instance, it alerts your Facebook friends and prompts you to invite them to buy tickets of their own. Disney quietly introduced the service on May 26 with a simple post on the site’s official “Toy Story 3” page, which has over 732,000 followers. While many theaters will not make tickets available for the film, which was made by Disney’s Pixar unit, for another week — its release date is June 18 — early results indicate that people are using the application to buy tickets in groups as large as 80, according to Disney. “The whole idea is that no friend gets left behind,” said Oliver Luckett, senior vice president and general manager of DigiSynd, a Disney subsidiary that manages the entertainment giant’s social networking presence. Disney Tickets Together, which has been in development for months, works with ticket-buying sites like Fandango.com and covers the majority of the movie theaters in North America, Mr. Luckett said. Facebook receives no percentage of the ticket sales but does, in theory, get more visitors on its site. For now, only “Toy Story 3” tickets are available. But Mr. Luckett said other Disney movies would follow if the application is deemed a success. Facebook, which is approaching 500 million users around the world, has become a crucial marketing tool for entertainment companies. Disney alone operates hundreds of promotional pages on the site for its various products — motion pictures, theme park attractions, consumer articles, television shows — that cumulatively reach tens of millions of people. But Disney Tickets Together represents a deepening relationship between businesses and Facebook users, according to Dan Rose, the site’s vice president for partnerships and platform marketing. Buying movie tickets in advance via the Web is becoming more common, especially in cities where screenings routinely sell out. But most tickets are sold the old-fashioned way: people show up at the box office at an appointed time. At most, online ticketing sites account for about 20 percent of the box office for a wide-release movie. Anything that increases ticket sales is likely to be warmly embraced by studio executives and theater owners, who are struggling with declining attendance. Although higher ticket prices have propped up the bottom line, moviegoing is on the decline. About 23.4 million people went to the movies over the Memorial Day weekend, a 22 percent decline from last year and the lowest total since 1993, according to Hollywood.com, which compiles box office statistics. Disney is distinctly positioned to bring new marketing ideas to the Web. Steven P. Jobs, the Apple chief executive, joined the Disney board with the 2006 acquisition of Pixar, which he had controlled, and became Disney’s largest shareholder. Sheryl Sandberg, Facebook’s chief operating officer, joined Disney’s board six months ago. The entertainment conglomerate has had difficulties figuring out its approach to its own Web site, Disney.com, largely because of management stumbles within the Disney unit that oversees that businesses, analysts say. But the company — notably its television group, which includes ABC and ESPN — has been aggressive about online video and Apple’s iTunes store and iPad. 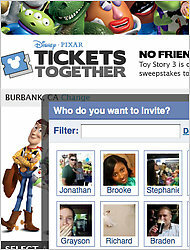 Disney Tickets Together works in the same manner as other Facebook applications. Users click on the “go to application” button and give the service access to personal information in their profiles. A page then loads ticket times at nearby theaters based on their profile location settings.